How would you like to change the face of your business, in the next 28 days…Even If You’re New? Don’t let this question fool you, this is serious. Any time you are approached with this sort of strategy, be sure you know what you’re getting into. That being said, this is not for the faint of heart. Your goals are going to be the driver of this strategy. If you’re looking to generate free leads, hang on tight. Most marketers move day to day and week to week, one to two videos at a time. We do really well with creating webinars, paying as much attention to detail and creating massive value that wants your audience begging for more. You gather up your value, create the most amazing webinar that has blessed the industry. You sit back proud as a peacock. 24 hours later, the voices of doubt start screaming. Prior to going forward, there’s something that needs to be understood. By avoiding your future success, you’re robbing someone that’s waiting for you. There are marketers in the industry, that need Your story to come out and inspire them to take action in their lives. Preparation of this 28 day strategy is going to be crucial to your success. The Content for your webinar is up to you. The preparation is in the sequence. And Lots of Value! Create your webinar around the most up to date training from a topic of choice. As you’re creating your Webinar and PowerPoint, break it down into 5 – 7 segments. 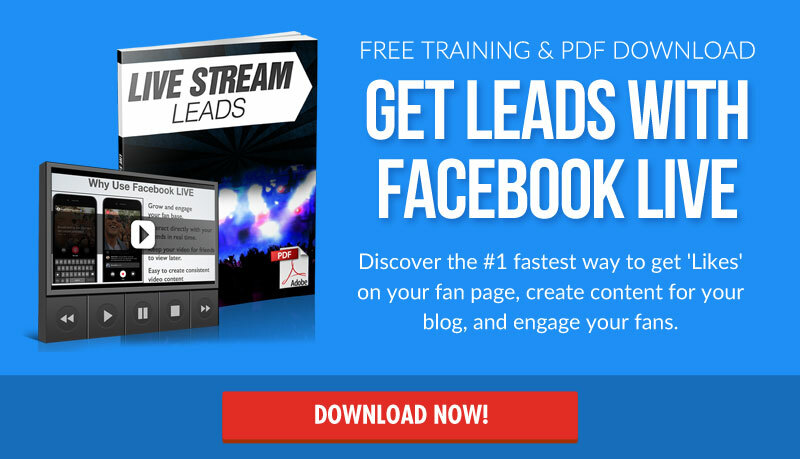 If you are in My Lead System Pro, I would highly recommend tapping into the numerous system campaigns and training, similar to this Facebook Live Training. Here’s where the magic happens. 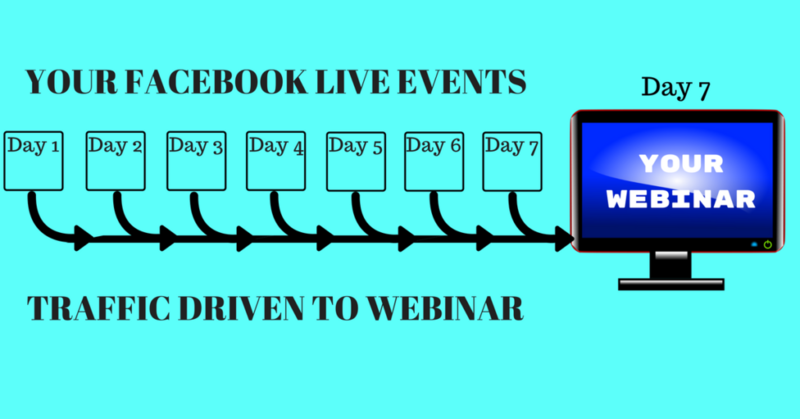 Those 5 – 7 segments of value that you created are going to be presented during your 7 days leading up to your webinar, using Facebook Live. You are also going to promote your FB Live events to your list and put out an alert that your Facebook event is coming. The Call To Action from these Live events is what you’re going use to drive traffic to your webinar and generate free leads. Sidenote: Be sure to integrate Aweber or a similar system to capture your leads. As you put out each Facebook Live, be sure to increase the buzz around your webinar. This webinar is going to be pure value. Be sure to talk about the products and services that you or your company offer. Your “Sell” will be the next webinar… You’re building your audience and you’re building trust. The key here is to be patient. See the Diagram Below for illustration. Similar to Week 1, follow the instructions above along with the diagram. 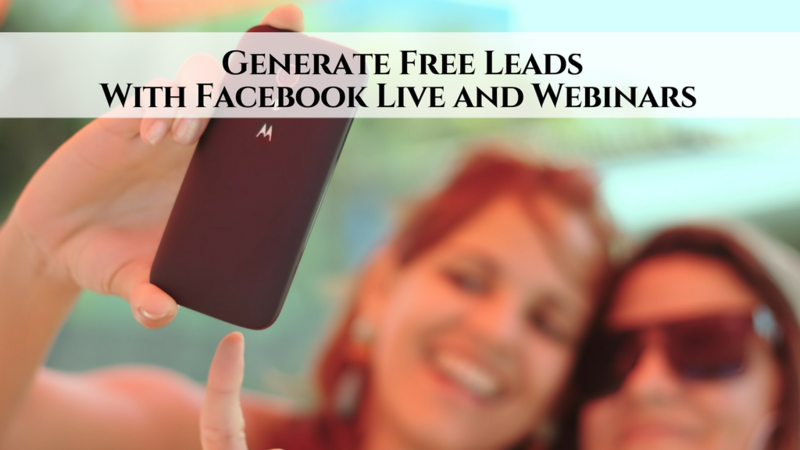 Host Facebook Live videos 5-7 days in a row, where the call to action will be to Register for Your Webinar! This is where your choice comes into the mix. Choose one of the products that your company provides and run your content and webinar around that information. If you are in MLSP, you could use the importance of Blogging, Capture Pages, Customer Relationship Manager, Webinars, Exchange of Value, etc… Weeks 2 and 3 are good time to move your audience into buying mode. This is where you’ll offer My Lead System Pro, through the topic you’ve chosen. This may not be a hard sell. More of an offer. Your week is going to follow suit from the weeks before. You have generated free leads for the last 3 weeks to a targeted audience. 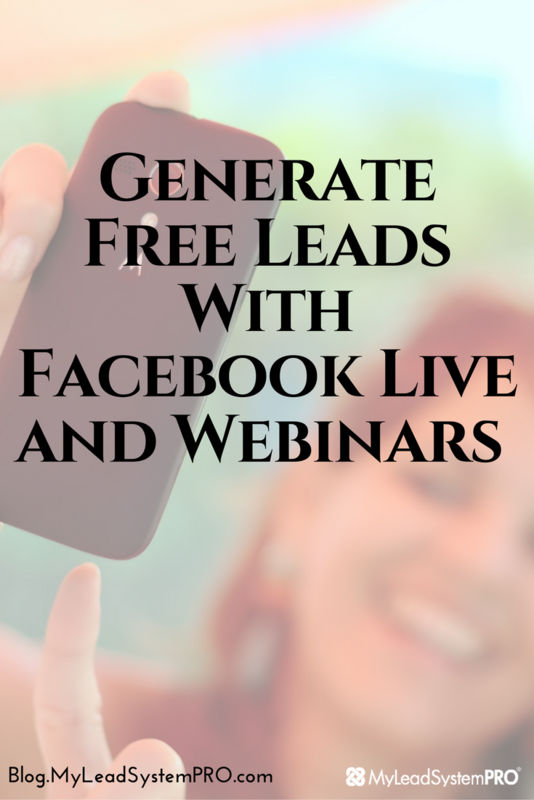 Your week 4 Facebook Lives should include, your lead generation part of your content. People dig that. You’ll be wrapping up the entire 3-4 week series in gang busters. You’ll put on your webinar and at the end is where you’ll perform a complete back office overview to show your new, highly engaged audience what you and MLSP has to offer. That wraps up your 28 day journey. I know that there is a small percentage that will put this concept into play. Then again, we know that 3% of the industry step up to the plate and truly inspire the masses. Will that be you? Can you imagine? Every time a 28 day cycles pass… your business could have been revolutionized? The whole face of your business could have dramatically changed! In this post on the ‘MLSP Leader Blog' Steve Krivda is going to give you the blueprint to completely transform your home biz in 28 days. August 2016 Member(s) of the Month! We’re Honoring Team Honey Badger! 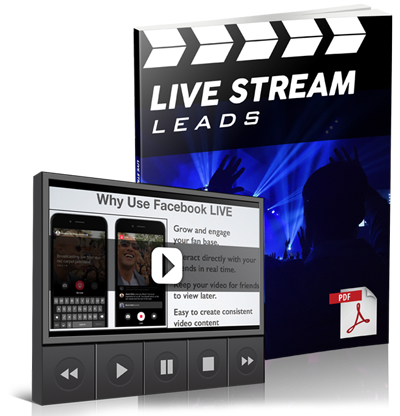 Great post… Facebook Live Webinars is deffinately the way forward!